Low-income college students promised state help paying for tuition will continue to go without it. Illinois Gov. Bruce Rauner has followed through on his pledge to reject funding for the Monetary Award Program. Gov. Rauner vetoed Democratic-backed legislation to pay for so-called "MAP grants" Friday afternoon. 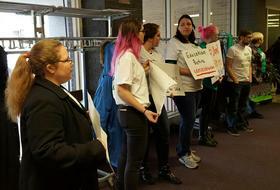 Students had traveled to Springfield in recent days to rally in support of the plan. But Governor Bruce Rauner said in his veto message that the bill would spend $720 million the state doesn't have, "would explode the State's budget deficit" and would exacerbate an already challenging cash flow situation. Higher education, as well as certain social services, are taking the brunt of the impasse. They've gone that entire time without dollars they've counted on from the state. It's led some universities and colleges to layoff professors and to close programs; there are reports of students looking to go out of state for school. Earlier this week, Rauner asked students to be patient. "It's very tragic situation, it's very upsetting to me, it's a failure of the government process that this is occurring," Rauner said. "I would encourage the students to stay and see if they can be patient and persistent along with us." Rauner, a Republican, says he does support the financial aid, but through legislation introduced by the G.O.P. That version also gives him authority to cut the budget elsewhere, and which would lessen universities' costs by lifting procurement rules (something school administrators have long asked for). Immediately after Rauner's veto, Republican legislators were out with press releases promoting their alternative plan, which would also get money to universities. Four-year universities left out of Democrats' bill, although they too have gone nearly eight months without state funding. Senate President John Cullerton says he's disappointed in the governor for letting students down. “DePaul University is disappointed that the political impasse has resulted in the state’s failure to meet its obligation of providing MAP awards to students in the state of Illinois," said president of DePaul University, Rev. Dennis H. Holtschneider, in a prepared statement. The veto comes at an important time for recruiters: High school seniors are choosing which college they'll attend next fall. Holtschneider says DePaul will honor MAP grants for incoming freshman come fall, as "uncertainty about MAP funding should not create additional anxiety in making the college choice that best meets their academic and career goals." But while DePaul continues to cover the tab for MAP students' grants, other schools say they can't afford it, leaving those students to come up with the case, to take out loans, to drop out, or to go into arrears on their tuition.